A recent LA Times article reported that multifamily construction rose to the fastest pace in six years. Indeed, my observation is that builders are building the most for rent multifamily units since the late 1980s. There are many reasons cited in the below article why this surge will not result in an oversupply over the next year or two. However, if the trend continues, some caution must eventually be applied to an ever surging supply. Even the 2013 USC Casden Multifamily Forecast warned that an ever increasing supply could eventually lead to lower rents and a rising vacancy rate. Usually, such overbuilding manifests itself in rent reductions during recessions and results in steeper decreases than otherwise. In the past, at some later stage in the cycle, developers switch from rental to condominiums and thereby reduce the supply of newly constructed rentals in Los Angeles. 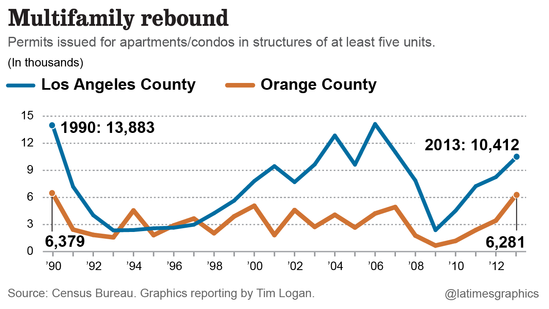 Apartment construction surges across the Southland amid rising rents – Los Angeles Times. At the recent Bisnow Multifamily Conference, many pundits debated what inning we were in. In other words, how many years will the rents rise and vacancies decline before rent fall and vacancies rise. I find it very difficult to predict what inning we are in. However, we can conclude that rentals properties are not inexpensive per square foot on a historical basis. Value plays usually occurs in the very early stage of recovery or late stage of the decline. So from this, we can conclude we are not in the very early stage of this positive cycle.